Tuesday September 8 1908 It was 28 years today since John & Hattie were married I was busy with the work all forenoon and in the afternoon went down to Woolfs had a good visit with Mary and got a lot of apples. Did the evening work when I came home. Wednesday September 9 1908 Fine weather was busy with the work in forenoon am feeding some chickens to sell. I slept part of the afternoon and we sat on the porch in the evening the moon was so bright. 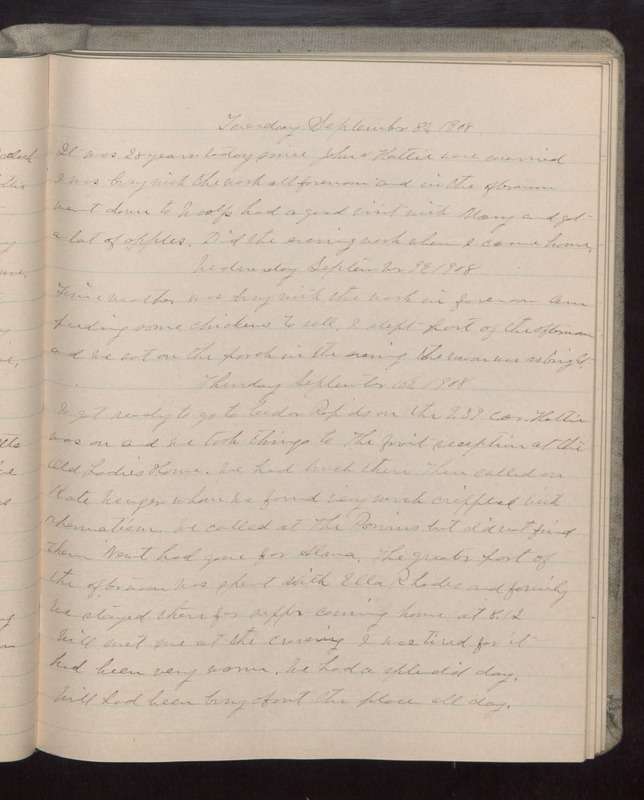 Thursday September 10 1908 I got ready to go to Cedar Rapids on the 9.39 car. Hattie was on and we took things to the [illegible] reception at the Old Ladies Home. We had lunch there then called on Kate Wenger whom we found very much crippled with rheumatism. We called at The [illegible] but did not find them Newt had gone for Alana. The greater part of the afternoon was spent with Ella Rhodes and family we stayed there for supper coming home at 8.12 Will met me at the crossing I was tired for it had been very warm. We had a splendid day. Will had been busy about the place all day.